Have you ever been daydreaming and noticed squiggly lines moving across your eyesight? If so, you will know that the more you focus on them, the harder they are to see – in fact doing so may drive you crazy! These annoying little shapes are called eye floaters, or to give them their correct name ‘myodesopsia’. For most people, they are completely harmless with no cause for concern, but occasionally they may be a warning sign of something much more serious. Here is the technical low-down on eye floaters and just why they annoy us so much. Myodesopsia is when a human experiences shapes and spots in their vision. Although they may look like worms or bacteria, thankfully they are not! Between the eye lens and retina is a gel-like substance called the vitreous humour, which is normally transparent. 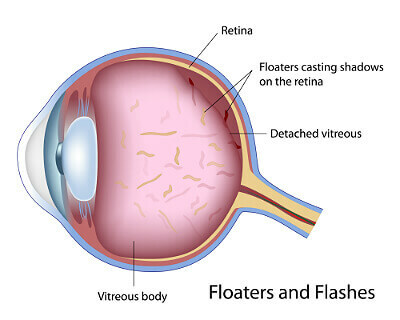 Eye floaters occur when there are deposits or interruptions in this normally clear substance. These deposits then cast shadows on the retina – which is when our brain notices them, leading to our perception of ‘floaters’. They are actually an incredibly common condition. One study of smartphone users found that 76% of participants see floaters in their vision, while 33% felt that their eyesight was affected by them. The most likely cause of myodesopsia is the aging process. As we get older, our vitreous humour gel shrinks, and starts to turn into liquid. 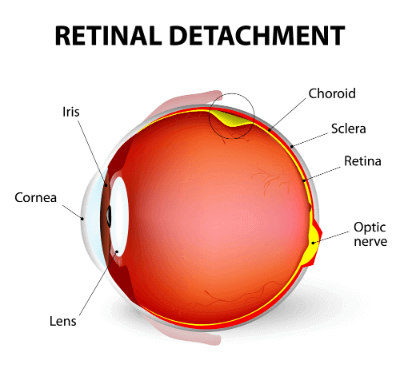 This puts pressure on the retina, increasing the likelihood of detachments and tears. The vast majority of eye floaters do not have serious consequences, but in the event of a retinal detachment, immediate medical attention is needed to assess the damage and potentially save a persons eyesight. Consult a doctor if you have eye floaters with ‘flashing lights‘ vision, and if you are unable to see from the sides of your eyes. When these symptoms are experienced together, they are warning signs that should not be ignored. Even though they affect a large proportion of the population, the usual advice for eye floaters is to do nothing. Aside from being a minor irritant, the vast majority of cases have no impact on a persons lifestyle or their ability to see. Performing surgery would simply increase the risk of complications. In rare cases, the number of shadows can accumulate and begin to significantly affect vision, so treatment may be necessary. Traditionally, a vitrectomy operation has been the only solution. This involves removing the vitreous humour and replacing it with a clear, saline substance, in order to provide good eyesight again. Advances in modern surgery have recently seen lasers also being used to treat myodesopsia. Pulses of light target and evaporate the floater deposits, turning them into a gas that can be absorbed back into the eye. The results of this technique are encouraging – in a South Korean study, over 91% of patients had vision interruptions disappear after YAG laser treatment! Often, the best treatment for many eye conditions is preventative treatment. Eating well, and maintaining a healthy lifestyle are essential components of a good eyesight regime. By doing this, we will hopefully stay healthier as we age, and limit any eye infections, inflammation, and eye floaters that we experience.